If you are looking for things to do in Calgary with your family, you have come to the right place! Calgary has so much to offer and a rich culture that centers are both the railroad and cowboys. (yup, good ol’ fashioned Cowboy themes are seriously everywhere, and it’s a blast!) Your family will be having so much fun having adventures that you won’t be able to wait for your next visit. Here are five of my favorite things to check out if you are looking for things to do in Calgary. 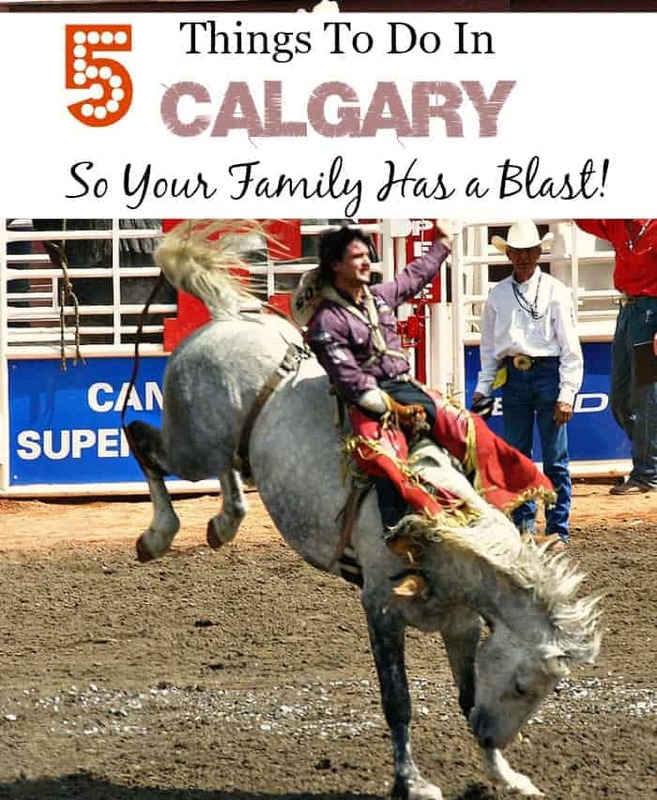 5 Things To Do In Calgary So Your Family Has a Blast! Are there any other things to do in Calgary that you would recommend? Let us know in the comments! Whether or not you are a history buff, you are going to love Heritage Park Historical Village. The Gasoline Museum, which is full of cool old fashioned cars, is open year round and sometimes offers children’s activities in the gallery year round. The true star of this park is the Historical Village which immerses you through costumed interpreters, in the history of Canada’s expansion west via the railroad! (trust me, cowboy culture will be here too!) The Village is an outdoor attraction that closes for winter, so see the website for full details when planning your trip. Want to take a walk on the wild side? You’ll want to allow a full day to explore the Calgary Zoo. This large zoo features so many fun animals such as bears, penguins, giraffes, rhinos, hippos, red pandas and more. The zoo has also recently included an amazing temporary Dinosaurs Alive exhibit that is way cool and is slated to reopen for a second summer in a row for 2016. Is your trip planned for frigid January? Check the schedule for the annual penguin walk where you can literally stand three feet from a penguin as they waddle through a path in the zoo, a local favorite! Like to add hands-on fun to your vacation? Stop by the Telus Spark Museum, a super fun, hands-on science museum. Watch live science demos, learn about the earth and energy, play in the oversized outdoor playground our just learn more about being human, there are tons of fun exhibits. If you have kids under nine, make sure to stop by the Creative Kids Museum exhibit where kids can splash, crawl and explore exhibits designed just for them. You’ll have a blast so add this one to your list! If you find yourself with a day where the weather is not cooperating on your trip, my first instinct would be to head over to the Devonian Gardens. This hidden gem located inside the Core Shopping Center is a full botanical garden and is free. Located between the fishy pond and the “living plant wall,” a children’s indoor playground is also tucked away. Once you’re done enjoying the urban oasis, drop by in the mall for some shopping or lunch. Planning on heading to Calgary in July? Then there is no way you can miss the Calgary Stampede, which is Calgary’s largest event of the year. During the stampede, the entire City turns to celebrate while cowboys round up cattle, ride bulls and show off their tricks both day and night. Don’t be fooled; this event is HUGE, full of daytime shows and entertainment, carnival games and all sorts of fun. Many places around town also host a traditional Stampede pancake breakfast, so make sure you check it out. If you can plan your trip to be there when the Calgary Stampede is happening, it will be an unforgettable trip! I have never been to Canada. This sounds like a great place to visit. Maybe I’ll get to visit one day. My son just said he’s ready for a zoo trip. I’m ready to take him. Calgary looks nice. Sounds like there’s a ton to do in Calgary. I love there’s a mix of activities for everyone from nature lovers to history buffs. LOL, I am quite familiar with many of those attractions! I went to the Stampede and Heritage Park almost on a yearly basis when I was growing up. Calgary looks like such a great place to explore with the family. The Calgary Zoo looks like a lot of fun. We are thinking about taking a family trip to Canada this summer. I haven’t been to Calgary, but it sounds like that is so much to do and see while there! There are so many great things to do in Calgary. I would love to go to the Calgary Zoo. Calgary is on our bucket list. We usually do our big vacation in July so it’s nice to know the Stampede happens during that month. Now I want to plan our trip! I have only driven around Calgary on the way to Banff and have heard of the Calgary Stampeded but it looks like there are some really fun things to do there! Will have to make a trip to see the city! I would love to visit Calgary. Seems like such a fun place with lots of things for families to enjoy. All of this looks amazing. We have talked about taking a visit. We need to start saving! I have yet to venture to Canada, but it is definitely on my travel list. All of these activities sound like so much fun! That sounds like a fun place to visit with families. I hope to get up there someday! We haven’t been to Calgary yet but it is on our list of places in the next two years… and you helped our planning! This looks like a great place to go on vacation. I would love to go to The Calgary Stampede. Calgary is an amazing city. It’s been on my travel bucket list for a while now, but we just haven’t been able to make it happen yet. We have never been to Calgary or Canada for the matter. It sounds like there is a lot of awesome stuff to do while there. Thanks for sharing. I’d definitely have to check out the Devonian Garden. I really like strolling through botanical gardens. I’ve always wanted to visit Calgary. I’ve always wanted to visit Canada period. There’s so much to see and do up there!